Nigeria's most corrupt ex-dictator, retired army general, Ibrahim Badamosi Babangida is hospitalized in a Paris hospital where he underwent surgery to remove tumor from one of his hands. Babangida quietly left Nigeria two weeks ago to undergo surgery and has since remained hospitalized in Paris. Saharareporters learnt that his cronies have been trooping to wish him well in his Paris hospital. Babangida's legendary loot is hidden in France and Monaco (a small tax heaven completely encircled by France). Last year, Saharareporters published photos from a lavish vacation of the Babangida's in Monaco exposing a wealthy lifestyle including a private jet and private parties. 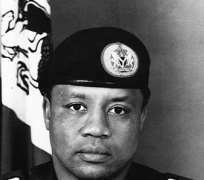 Between 1985 -1993 Babangida ran a kleptocracy that saw Nigeria lose $12 billion in Gulf war oil windfall in 1991 alone. He was forced out of power in 1993 after he annulled Nigeria's freeest and fairest election won by businessman Mashood Abiola.